Heineken is running “Moderate Drinkers Wanted,” an integrated global marketing campaign championing responsible alcohol consumption. Rooted in research that shows responsible drinking is becoming the preferred means of enjoyment for those 21+, Heineken® is using the campaign to encourage men to drink responsibly during their nights out by showcasing how potential partners may find those who practice responsible behavior more approachable. The “Moderate Drinkers Wanted” commercial brings together women in Los Angeles bars and the subway to sing a version of Bonnie Tyler’s 1986 hit “I need a Hero”. 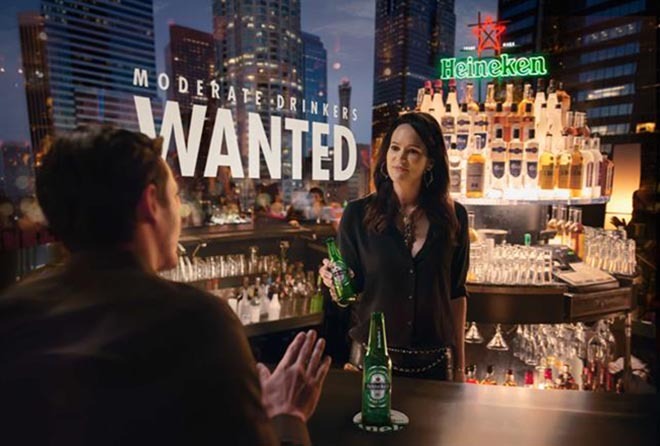 “Moderate Drinkers Wanted” is the third chapter in Heineken®’s ongoing commitment to highlighting responsible consumption as the best way to make the most of your celebrations. The commitment kicked off in 2011 with the launch of “Sunrise,” a campaign which brought to life the powerful idea that there are no limits when you know your limits. The second instalment launched in 2014, ‘Dance More, Drink Slow,’ was built around a pioneering partnership with DJ Armin Van Buuren. Filming was shot in Los Angeles bars and the subway by director Nicolai Fuglsig via MJZ with executive producer Debbie Turner, producer Laurie Boccaccio, and production supervisor Adriana Cebada More. Media was handled at Starcom Mediavest Group. Post production and VFX were produced at Nineteen Twenty Post by VFX supervisors Ludo Fealy and Ryan Hadfield, producer Sally Pritchett, Nuke VFX team Robert Lilley, Graeme Eglin and Chrys Aldred. Music was produced at Soundtree, London, by orchestrator/producer Evan Jolly, and producers Peter Raeburn. Editor was Neil Smith at Work Post. Colourist was Jean-Clément Soret at MPC.